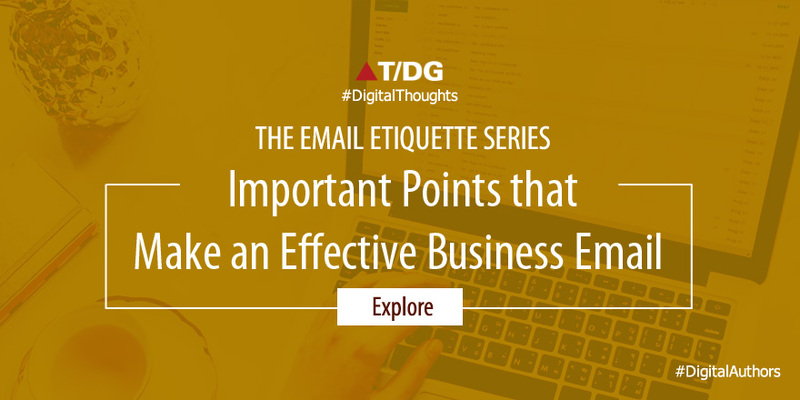 The Email Etiquette Series is all about writing emails that people love to read. In the first post of the series, we had looked at the common mistakes to avoid when writing professional emails to colleagues, clients or any other professional acquaintance. In this blog post, we shall focus on the things you should focus on and these are pointers that you cannot afford to miss. So, let’s get straight to the point. When writing a professional email, one of the first things to focus on is the goal. Why are you writing the email in the first place and what are the results you want to achieve from it? The goal is nothing but the purpose of the email. You may choose to write an email to direct readers to a new website or to make them perform some action. However, experts recommend that you keep it short and simple, instead of expecting the reader to take a series of actions. For example, when sending emails about the launch of a new website, the first email should be written with the goal of introducing the reader to the website. You can ask readers to perform actions on the website in the subsequent emails. Talking about first impressions, the subject line is the first thing about your email that your reader comes across. The subject line should be good enough to hold interest and make them open the email. Keep your subject line short, precise and to the point, say experts and also keep it as relevant to the email body as possible. However, a simple ‘Hi!’ seldom works and is likely to make your email end up in the spam folder. Tricky as it sounds, the perfect subject line is not that elusive. A good subject line, although important, is only half the job done when it comes to ensuring that the reader reads the email. Your email should have a proper opening, which includes the salutation. Always make sure you choose the right degree of formality depending on the subject of the email and its recipient. Words such as ‘Yo’ and ‘Hey’ are never acceptable, even if you are familiar with the recipient. Choose to use ‘Hello’ instead and use a more casual tone if required. Thank you for registering with XYZ website. So, you have the subject line and the opening of your email sorted. What next? Well, next comes the body of hte email and this is where you present all the information you want to convey to the reader. Make sure you put in the information in such a way that it doesn’t leave the reader confused. Experts recommend that you use bullet points to make it easier for the reader to grasp all the information at a glance. This applies when you are describing a product. • Cross-browser, cross-platform support: Extend the test scope across Web, Windows, Mobile, Angular JS, and test applications on Chrome, Firefox, and more. • A zero coding test automation tool: Cut down on your resource training efforts and team sizes with QARA Test’s zero coding testing solution. Note that your objective should be to make the reader understand the text with the least effort. Discover how QARA Test can help you overcome the challenges in software testing. Click on the button below to request a free demo. Now, we move on to the last segment of your email – the closing. The fact that the reader has taken the efforts to read through your email, makes it your responsibility to end the mail in a way that leaves him/her feeling good. The closing can help leave a lasting impression about your company, hence its importance to your email. There are various forms of email closings and some of them are formal while others are more casual. Choose one that complements the salutation and the general tone of the email. Thanks for your interest in QARA Test. For any queries, drop us an email on test@xyz.com and we shall be glad to assist you. Note that it is recommended that you don’t use ‘Yours sincerely’ and ‘Yours Truly’ as these are now considered obsolete and might make you sound like you belong to the Victorian era!! After you have drafted the email following the tips given above, sign off with a professional signature. It serves as the icing on the cake and you can easily create one for yourself using templates available online. You may also choose to add a post script (P.S.) after the signature to mention additional details and even discounts and offers. Last but not the least, don’t forget to proofread before you send it! Once you master the little nuances, you’ll discover that writing an effective business email is actually easier than it sounds.